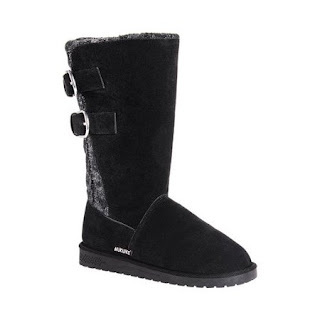 Fashion meets comfort and warmth in the MUK LUKS Jean Mid Calf Boot! The coziest and warmest boot you will ever own, this pull-on boot features a functional buckle detail with a knit sweater accent. Wipe with a damp cloth, no bleach, lay flat to dry. Treaded TPR sole 100% Polyester brushed tricot insole 100% Polyester sherpa lining.